Multiple Grade 1 winner Paradise Woods is scheduled to make her first start under the direction of trainer John Shirreffs in this Saturday’s Grade 2, $250,000 Santa Monica Stakes for older fillies and mares at seven furlongs. It would mark the first race in seven months for the 5-year-old daughter of Union Rags formerly trained by Richard Mandella. Working on a fast main track Sunday for possible Santa Monica starts were a trio of Bob Baffert runners -- Dream Tree, Emboldened and Marley’s Freedom. The latter two went five furlongs in company and were clocked in identical bullet times of 58.80. 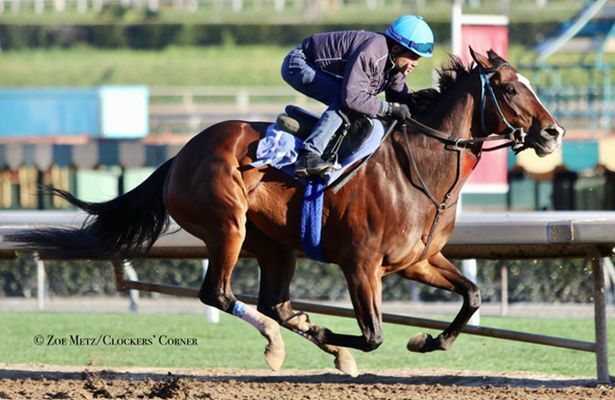 Dream Tree, working solo, also received a bullet for a six furlong move in 1:11.60. The 27-year-old Atzeni, a native of the Mediterranean island Sardinia, won the Thunder Road Stakes (G3) for trainer Simon Callaghan on True Valour at a $25 win payoff; 18-year-old apprentice Diaz from Puerto Rico took the sixth race aboard Hero For Hire ($26) trained by Jeff Bonde; and the 30-year-old Foley, a native of Ireland, posted a $34.40 upset with John Sadler trainee Platinum Warrior in the San Marcos Stakes (G3). Saturday was a first for Callaghan as well. In addition to True Valour, the native of England who turns 39 on March 7, also saddled odds-on favorite Bellafina to win the Las Virgenes Stakes (G2). “That’s the first time I won two stakes on the same day,” Callaghan said.